by David B. Simons Jr. 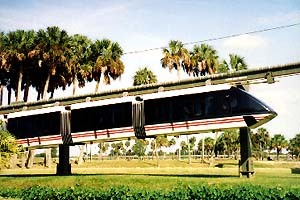 Original "box car" monorail trains built by Arrow Development. On July 2nd , Busch Gardens opened the Edge of Africa, a new section of the park where guests can walk through parts of the African veldt and get an up-close view of the animals. Having just survived a re-alignment to make room for this new section, the monorail recently re-opened. [It turns out the re-alignment was only a stay-of-execution; this is another monorail system that was demolished soon after I wrote about it. 'Something I said?] For the last few months, it has been out of service while this addition was being constructed, much to the chagrin of the Walt Disney World monorail drivers who recently made their annual pilgrimage across the state to ride the big coasters and the monorail. Luckily, the Azzollinis (TMS members from New York) and I visited the Tampa attraction prior to its suspension of service. The monorail at Busch Gardens opened in its original form in 1966. This small suspended system operated boxy trains that used two propane fired, air cooled, aluminum Corvair engines per train to produce the AC power necessary for the electric motors. Personally, my favorite part was the Anheuser-Busch eagle emblazoned on each red and white car. In 1987 it was closed to allow for a complete overhaul of the system, and re-opened in February of 1988. Intamin Inc. of Switzerland built six sleek new trains for the redesigned system. 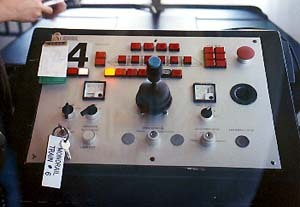 Bus bars retro-fitted to the overhead track now provide power for the six car trains. Better air conditioning is aided by deeply tinted windows on each car. Seventy two passenger trains are capable of six mph, making their round trip in 10 to 12 minutes. On the one and a half mile journey, drivers spiel about the beautiful African animals that inhabit the area. On a visit in '94, my train was delayed by a stubborn ostrich who refused to move out of the way for the low hanging train. Several horn blasts from the driver failed to impress the obstinate bird, and finally a very gentle nudge from the train moving at a snail's pace convinced him that the human cargo on board would be able to enjoy looking at him more easily if he were to stand to one side, rather than in front of the train. Luckily, we encountered no such obstacles from lions, hippos, or giraffes and the rest of the trip was uneventful. 'Just another example of how the environmentally friendly monorail can be accepted easily into an eco-system without disturbing the occupants, even after a challenge from a large, mad bird. Interestingly, this is not the only monorail system operated at a Busch Gardens theme park. The brewer's Los Angeles location operated a similar [to the first Tampa design] monorail that went through the brewery, allowing guests to view the process that produced Budweiser, Michelob, and Busch Bavarian beers. The most striking visual aspect of the trip for us monorail fans, was the section of the track where the monorail used the same support pylons for the tracks entering and exiting the building. Great pictures were available to those who did not mind waiting for two trains to pass, one above the other. I can imagine monorail fans trying to decide which park to visit. "Hmmmm, animals or beer?" Well, tough luck kids, the beer monorail is no more. [And I hadn't even written about it yet!] You'll have to visit Tampa if you want to ride a Busch Gardens monorail these days. With the park's new addition, as well as the added attraction of the best coasters in the Southeast, many people will be doing just that.